Charm Bracelets, Necklaces, Earrings, Watches. Surf Dancer Crystal Heart, Jackpot, etc. Wild horses have a majestic beauty and an inspiring, untamed spirit. You can celebrate these beautiful creatures with this crystal horse art necklace with Swarovski crystals. This exquisite design features a handcrafted, intricately faceted heart-shaped light blue crystal with a faithful recreation of "Surf Dancer" artwork by acclaimed artist Chuck DeHaan embedded inside. The artwork features a horse galloping along a beach shoreline against crashing waves.Gracing the top of the sparkling crystal heart is a solid sterling silver bail in the shape of a horseshoe with a stunning pave of genuine Swarovski crystals inside.This horse art jewelry design is exclusively from The Bradford Exchange, and comes on a decorative solid sterling silver. It arrives in a deluxe velvet pouch and gift box. High demand is expected, so order now.California Residents click here for Proposition 65 notice. You can take a girl out of the country but you can't take her out of her boots. And that's especially true when she's wearing our Country Rose Pendant Necklace, a fine jewelry design, exclusively from The Bradford Exchange. Expertly handcrafted and lavishly plated in sterling silver with rich 18K gold-plated accents, this Western boot pendant features a custom-designed cowgirl boot. Filigree detailing, inspired by the tooling of a classic cowboy boot, and 18K gold-plated roses at the heel add striking style. A delicate 18K gold-plated rose charm complements the boot necklace, while the reverse side of the pendant is engraved with the words "Country Rose". Every aspect of this pendant will speak to a true country girl's soul, and its gorgeous design and stunning craftsmanship make it a stylish addition to any woman's wardrobe. The Country Rose Pendant Necklace is the perfect gift for yourself or a special country girl in your life. Strong demand is expected. Order now! Scary sights and fantastic frights await in this spooktacular Tim Burton's Nightmare Before Christmas charm bracelet available from The Bradford Exchange! Prepare to visit Halloween Town with its most famous citizens including Jack Skellington, Sally, Dr. Finkelstein and more in a delightfully charming Nightmare Before Christmas jewelry creation that is sure to scare up some smiles! Inspired by the critically acclaimed movie, Tim Burton's Nightmare Before Christmas charm bracelet features 8 handcrafted charms that capture all the crazy characters in Tim Burton's frighteningly fun style. Each character gleams in sterling silver plating with 24K-gold plated accents. Plus, colorful Swarovski crystals give each individual charm sparkle while Swarovski crystal briolettes add to the shimmering effect. 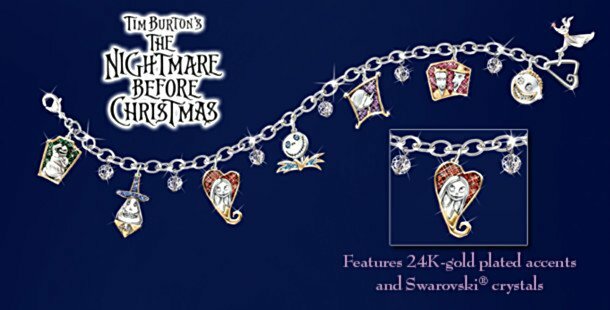 Hurry to own this Nightmare Before Christmas jewelry for yourself or give as a collectible Nightmare Before Christmas gift for any Halloween Town fan. Strong demand is expected. Order now!This fine jewelry is intended only for adults, but suitable for children 8 and over. There are treasures beneath the dark earth of Tanzania, buried deep in the rolling hills near Mount Kilimanjaro. Only here can you find tanzanite, a regal purple gemstone that flashes with elegant fire, ready to adorn the ring of a queen, a princess, or you! Introducing the Tanzanite Elegance Ring, a fine jewelry exclusive from The Bradford Exchange that blends contemporary style with the feel of vintage luxury, and the glory of 20 genuine tanzanite stones!This exquisite ring is expertly handcrafted in solid sterling silver with a classic dome style that is certain to command attention. The epitome of elegance, its 20 tanzanite gemstones are set in rows among hand-engraved filigree detailing. This stunning ring is perfect with either casual attire or evening wear, and even arrives in a custom presentation case, perfect for safekeeping or gift-giving. Tremendous demand is expected for this spectacular Tanzanite Elegance Ring, so don't wait. Order now! Since Queen Elizabeth II ascended the throne on February 6, 1952, she has been a source of inspiration to her people. Now this replica of her engagement ring offers the perfect way to celebrate Her Majesty's amazing legacy and fairy tale love story with Prince Philip. Introducing the Reign of Romance Ring, a spectacular fine jewelry design available ONLY from The Bradford Exchange and boasting over 5 carats of sparkling Diamonesk® stones! Our exclusive Diamonesk simulated diamonds sparkle with the fire and brilliance of the finest genuine gemstones, but at a fraction of the cost, giving you a royal opportunity to enjoy this replica engagement ring every single day.Queen Elizabeth II and Prince Philip sent one another love letters for 8 years before becoming engaged in 1946, cementing a romance that endures to this day. In a fitting tribute to their love, this gorgeous women's ring is finely handcrafted in solid sterling silver, and showcases a magnificently sized Diamonesk simulated diamond at its center, with 6 additional stones in pave settings on each side, beautifully replicating Her Majesty's dazzling engagement ring. It arrives in a custom presentation case and gift box, perfect for safekeeping or presenting to your special someone. Strong demand is expected for this extraordinary fine jewelry exclusive, so don't wait. Order now! If painted ponies and country music are your kind of giddy-up, then you'll want to lasso our Country At Heart Bracelet, a fine jewelry design exclusively from The Bradford Exchange. A full dozen beautifully designed and individually crafted charms dress up this women's bracelet and are lavishly plated in rich 18K gold and shimmering sterling silver. Genuine Swarovski crystals and dramatic enamel accents add even more sparkle.The finely sculpted charms include a cowboy hat, saddle, cowboy boot, "Cowgirl" callout, horse, horseshoe, "COUNTRY AT HEART" heart and more. Each interchangeable charm moves freely on a 7-1/2" sterling silver-plated bracelet. Your Country At Heart Bracelet arrives in a velvet jewelry pouch and gift box. This fashionably chic charm bracelet is a great way to let the country girl in you shine. It also makes a wonderful gift for the cowgirl in your life. Strong demand is expected. Order now! Falling in love can feel like a fairy tale, complete with the promise of happily ever after! Now a dazzling personalized bridal ring captures all the meaning of that storybook romance in a design that will take your breath away. The Bradford Exchange is proud to unveil the Once Upon a Romance Personalized Ring for couples, an exclusive fine jewelry design you can customize to make truly yours. Simply add a personal engraving of your names, a date or a special message for FREE to create a one-of-a-kind heirloom. You can even create a custom sentiment card for the perfect finishing touch.Exquisitely handcrafted of solid sterling silver and gleaming with platinum plating, this unique personalized ring shimmers with 3 full carats of our exclusive Diamonesk® simulated diamonds. Captured across three impressive center stones and in the intricate gallery work along the sides of the ring, Diamonesk® gems possess a cut, color and clarity that rivals the fire and brilliance of the finest flawless diamonds at a fraction of the cost. Don't miss your chance to tell your love story in your own words with the Once Upon a Romance Personalized Ring. Strong demand is anticipated, hurry and order now! 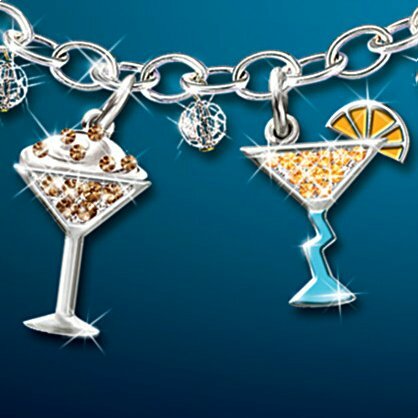 Whether you prefer it shaken or stirred, now you can enjoy your favorite cocktail anytime with a collectible martini charm bracelet with Swarovski® crystals that boasts 9 martini charms with sculptural "garnishes," vivid enamel accents and 8 bezel-set crystal charms. As seen on Lifetime Television's "The Balancing Act. 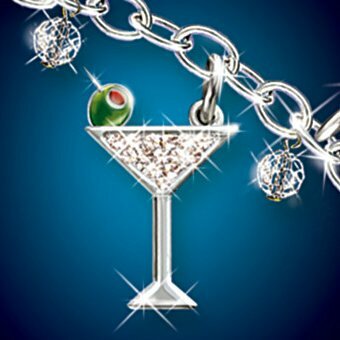 "From Apple to Cosmo and Dirty with an olive, celebrate the pleasures of a perfect cocktail with this captivating martini charm bracelet, a fine jewelry design available only from The Bradford Exchange. 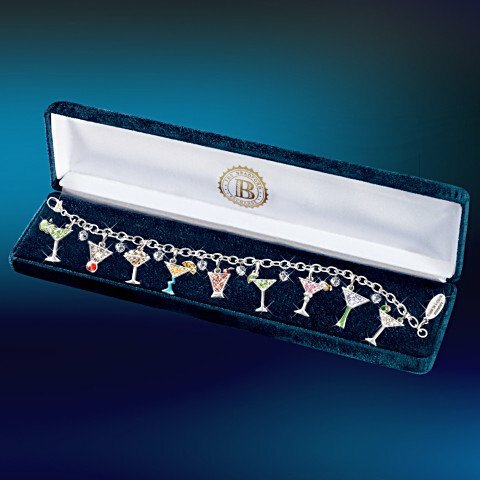 This sterling silver-plated, handcrafted charm bracelet includes an engraved tag charm: "It must be 5 o'clock somewhere!" Perfect for any occasion and it makes a unique jewelry gift for her. Heavy demand is expected, and you won't want to miss out. Order now! Throughout history, the beauty of nature has shaped cultures and inspired sacred symbols, and now this Sedona Sky Pendant Necklace captures two symbolic treasures, turquoise and the eagle's feathers, and combines them in a unique stylish, and meaningful fine jewelry exclusive from The Bradford Exchange. In Native American folklore, turquoise is cherished as a symbol of honor and friendship, a piece of sky that fell from the heavens and connects us to the Great Spirit. That connection is represented by the eagle's feathers as well, and because it flies closer to the heavens than any other bird, its feathers are considered sacred symbols of wisdom, freedom and trust.A large genuine turquoise cabochon framed in a Native American-inspired beaded setting is the centerpiece of this handcrafted, sterling silver-plated pendant necklace. 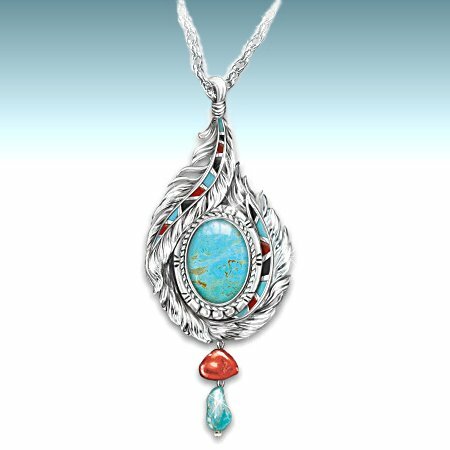 The pendant's border swirls around the turquoise, expertly sculpted to resemble eagle feathers, and hand-enameled red, black and turquoise details reflect the rich colors of the Sedona sky and red rock landscape. Genuine red jasper and turquoise drop beads add even more style to the pendant. The necklace hangs from a chain with red jasper beads on each side, enhanced with turquoise-colored seed beads. Your necklace even arrives in a velvet jewelry pouch and gift box. Strong demand is expected for this dramatic Native American-inspired pendant necklace, so don't delay. Order now! With a loving embrace to their history and culture, the Native American people have always found spirituality and sacred symbols within the beauty of nature. They believed that turquoise is actually a piece of the sky that fell from the heavens and that the eagle flies closer to the heavens than any other bird. Now, you can celebrate these two sacred symbols in a stunning women's bracelet, Sedona Sky, a fine jewelry design exclusively from The Bradford Exchange.Meticulously handcrafted and plated in sterling silver, this striking turquoise cuff bracelet features a large genuine turquoise cabochon framed in a Native American-style beaded setting. The sides of the bracelet are beautifully textured to resemble an eagle feather while the rich colors of the Sedona Sky and landscape are represented on the center band of this jewelry in delicately hand-enameled accents of red, black and turquoise. Sure to be cherished by anyone who wears it, strong demand is expected for this exquisite jewelry, so order now! With his head held proudly and his mane flowing in the wind, the magnificent horse evokes an exhilarating sense of freedom like no other creature. 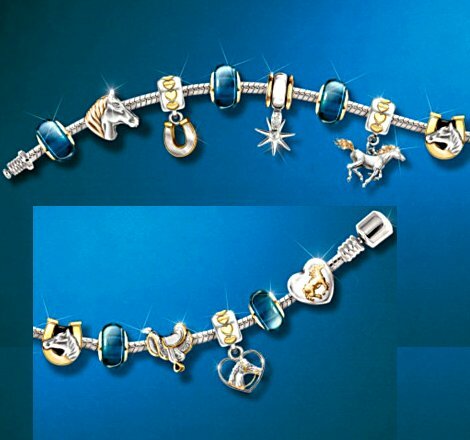 Now, you can celebrate this stunning wonder of nature with this sparkling horse charm bracelet, a fine jewelry design exclusively from The Bradford Exchange.Exquisitely handcrafted, this horse keepsake jewelry features 13 interchangeable charms plated in shimmering sterling silver with 24K gold-plated accents. Charms include a two-toned saddle, a solid heart with a golden horse portrait, a saddle and much more. Plus, this bracelet arrives in a velvet jeweler's pouch and gift box, perfect for safekeeping and gift-giving. This bracelet is a great way to show your love for horses or the perfect jewelry gift for horse lovers, but strong demand is expected. Order now!